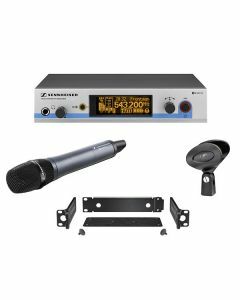 The Sennheiser EW 500-965 G3 GB wireless handheld vocal microphone set is a top-notch vocal system. The switchable cardioid/super-cardioid SKM 500-965 G3 mic comes with EM 500 G3 true diversity receiver for unparalleled reception and MZQ 1 microphone clip. The EW 500-965 G3 should be a mandatory addition to any presentation or recording set. A design centred on high performance and portability does not compromise on its internal specifications. Sennheiser’s handheld mic is complimented by a straightforward graphic display and simple menu. The large-diaphragm true condenser switchable cardioid/super-cardioid microphone capsule is breathtakingly resonant and free of distortion – a flagship mic that rightly sits at the pinnacle of its market. The true diversity receiver keeps excellent reception.